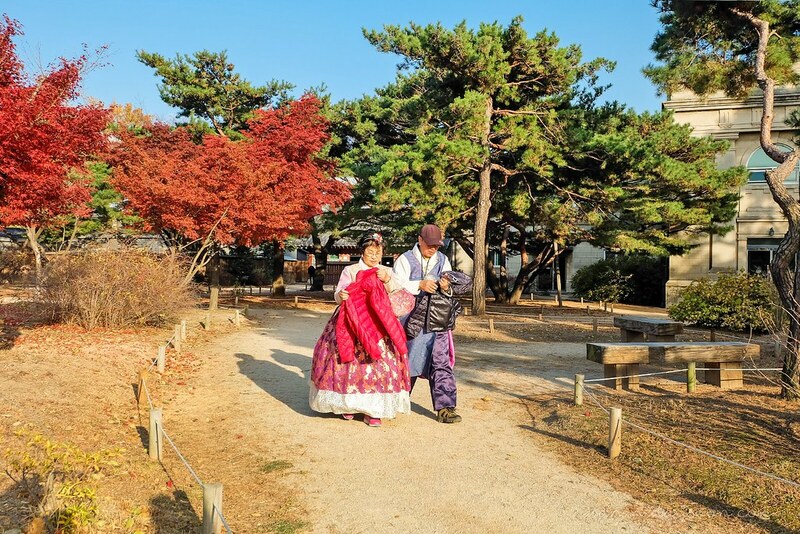 The most anticipated day of our trip has finally arrived as we get to try Korea's traditional clothing Hanbok. 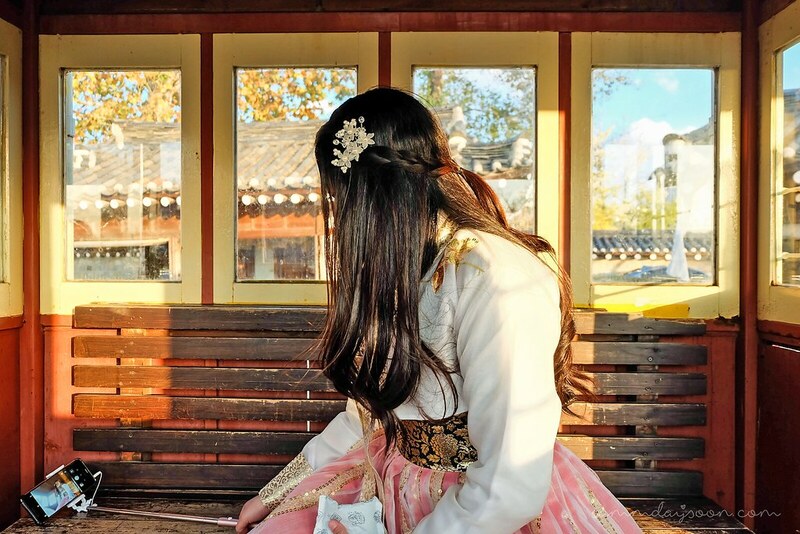 It was worn daily up until a century ago but now it is only used by Koreans on festive occasions and special times such as Wedding, Chuseok (Korean Thanksgiving), and Seollal (Korean New Year). 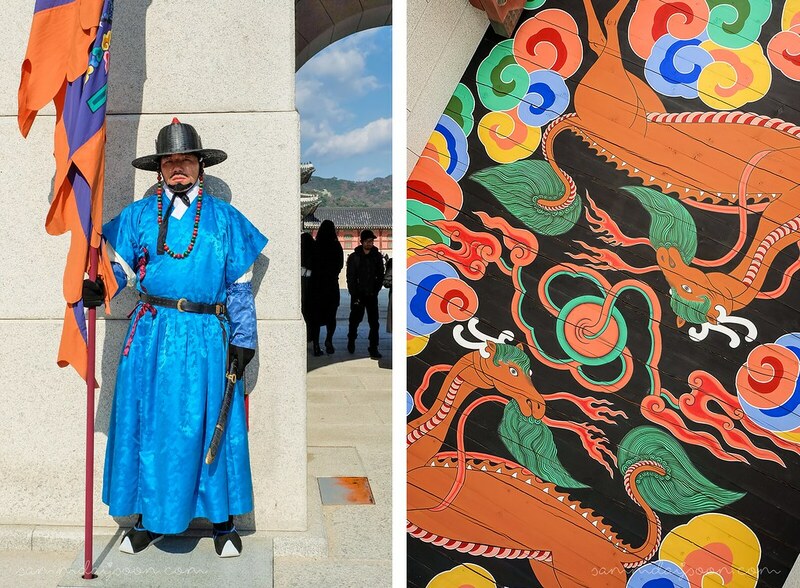 A royal guard in Ggwanghwamun gate and artistically painted ceiling. 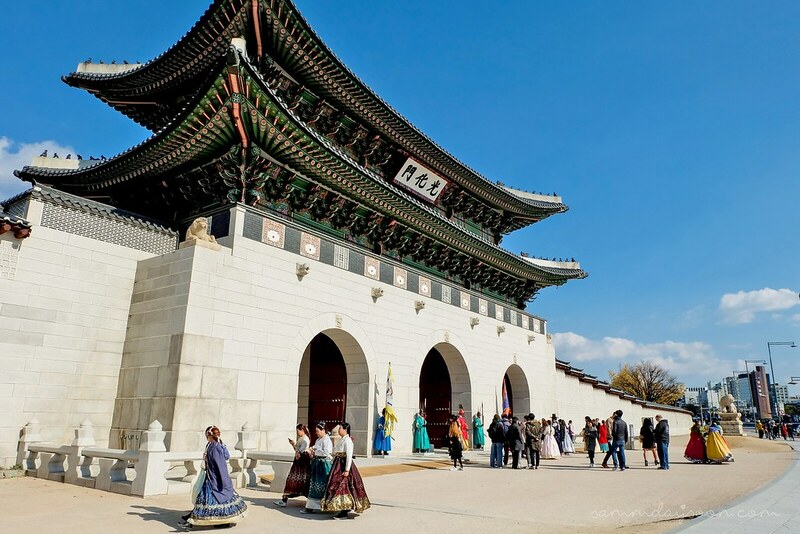 We missed the Royal Changing of Guards as we decided to start the day at Gwanghamun Square. 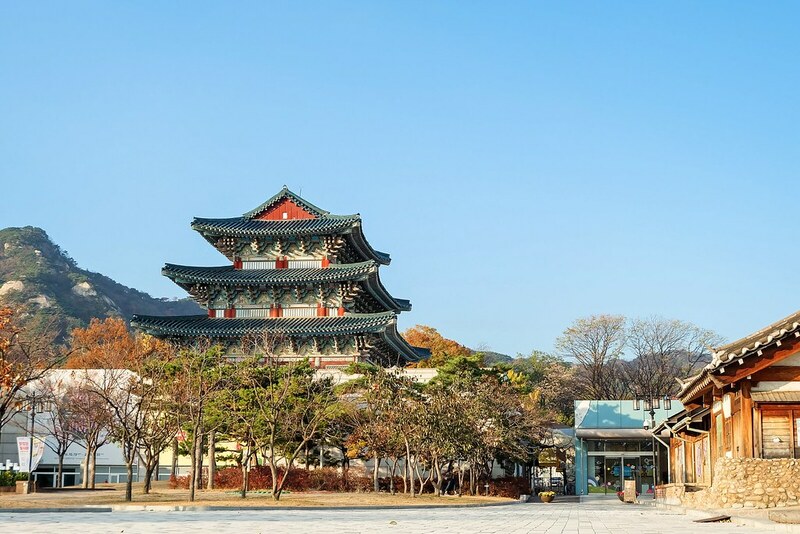 We spent some time at the exhibition halls of King Sejong and Admiral Yi Sunshin; two of the most respected and astounding heroes in Korean history which were a great start for today's theme. After a quick brunch at a nearby restaurant, we then proceed to Seohwa Hanbok just right across Gyeongbokgung Palace. 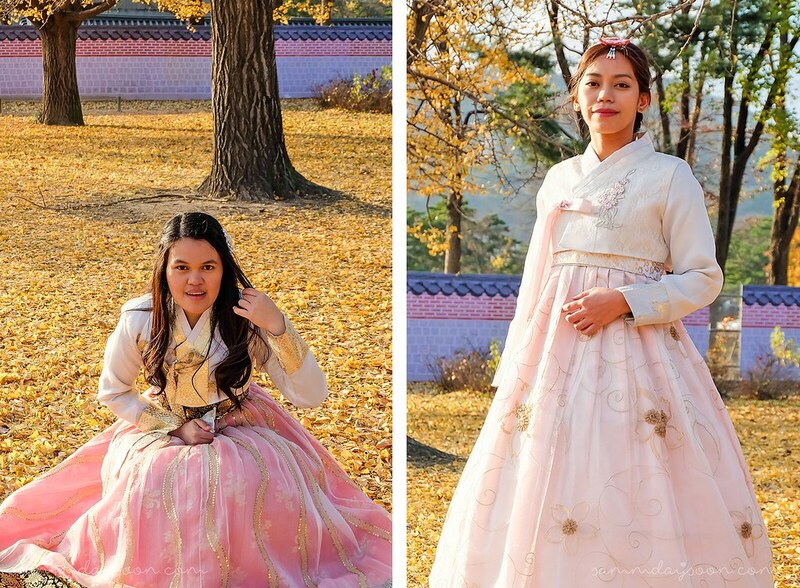 We had no reservations and queue for about 30 mins until we were individually assisted for hanbok fitting. 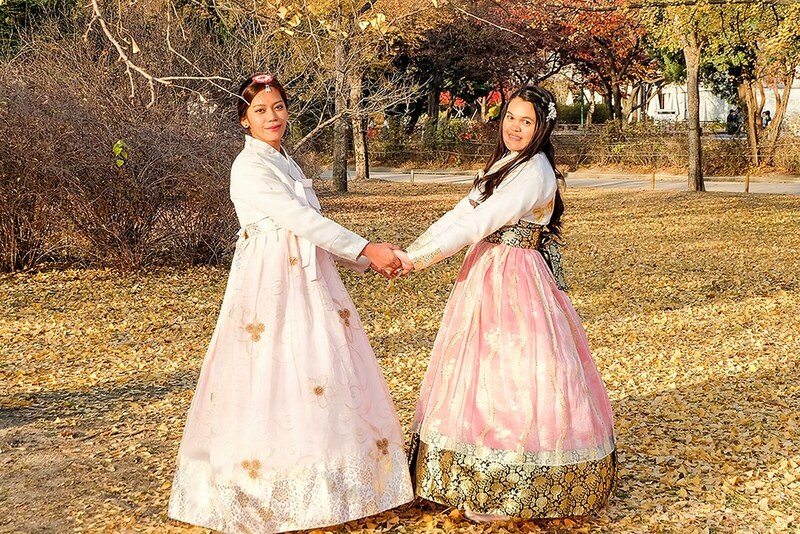 We were presented with a lot of bright and pretty Hanbok but as soon as I found the white with blush pink and gold accent dress, I knew it's the one for me. It looks perfectly sunny on the photo but it's actually freezing and windy that time. 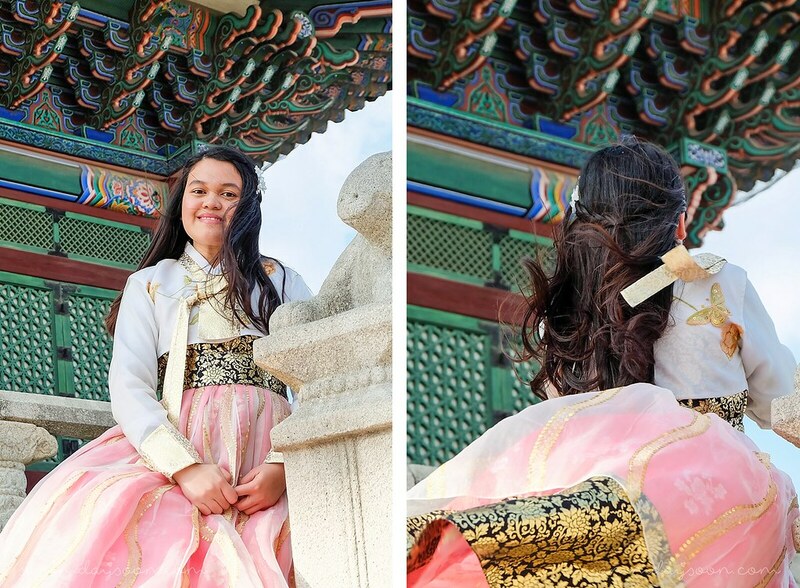 And if not for the frigid weather, we could have rented the dress the whole day as originally planned. 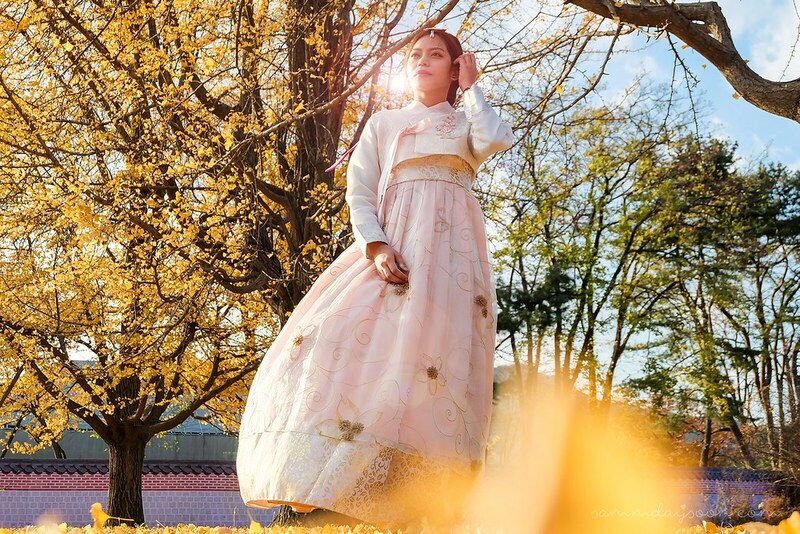 I couldn't ask for a better Hanbok than this, simple yet elegant. 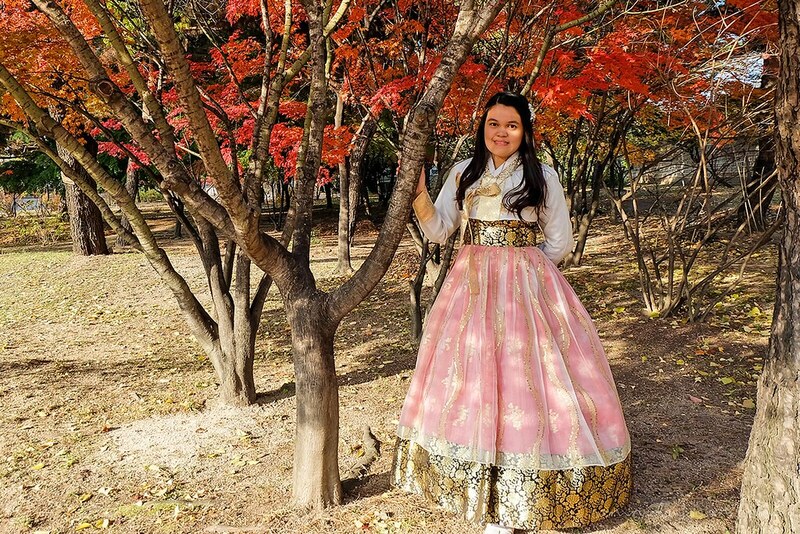 The subtleness of pink, a dash of gold and minimal embroidered flower accents is just how I pictured my Hanbok. 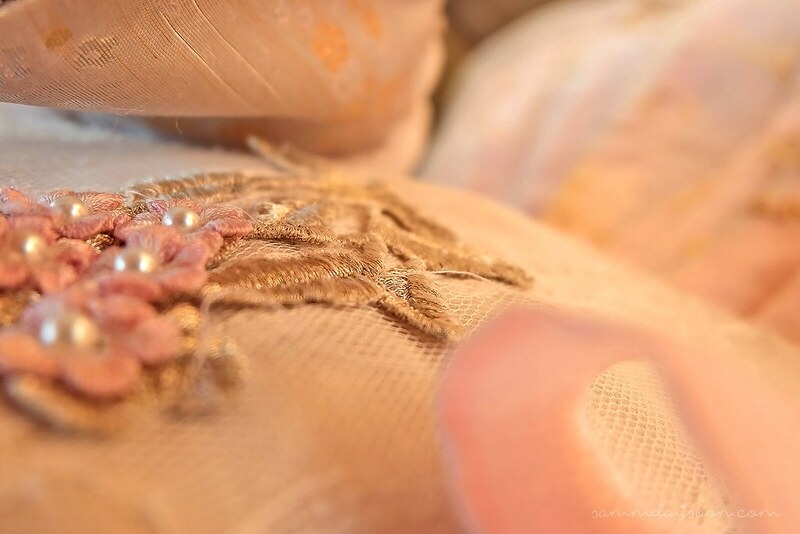 My best friend opted for a more pinkish shade with gold and black flower patterns, butterfly accents and gold sequence. Looks pretty right? 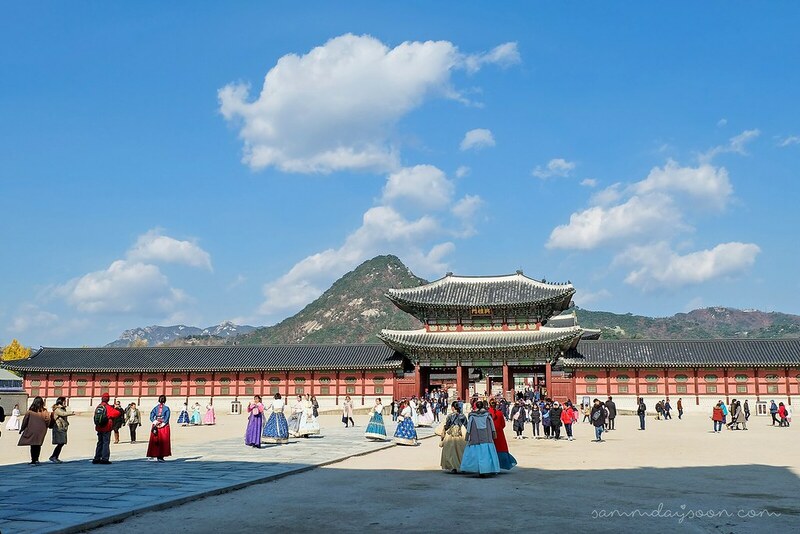 After all the fitting and documentation process, we head out to Gyeongbokgung Palace, just 5 minutes walk from the rental shop. 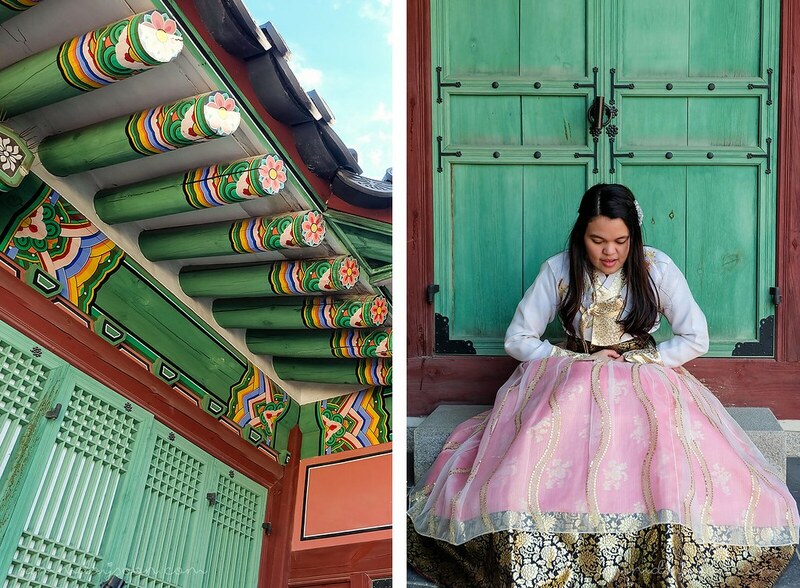 By the way, admission to Seoul's Palaces is FREE when wearing Hanbok. Yay! 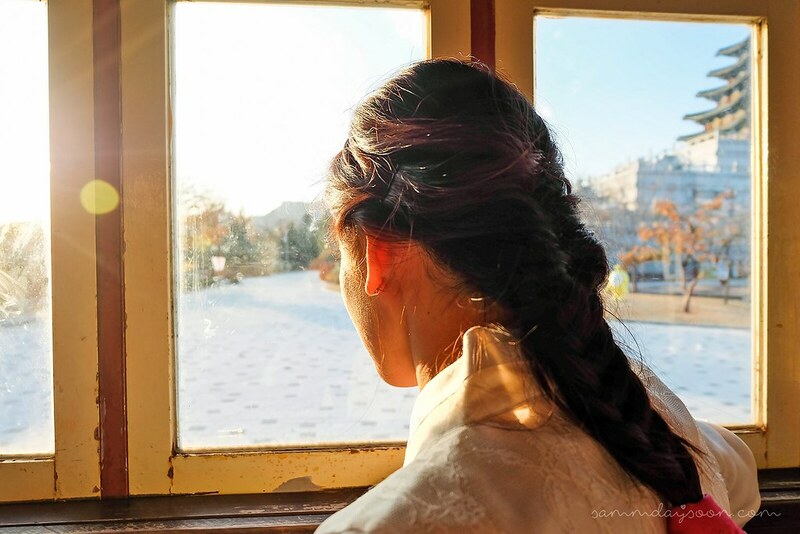 I know I mentioned this a lot from the previous posts, but that day was incredibly cold yet sunny that even holding a camera and taking a snap of a decent photo was quite challenging. 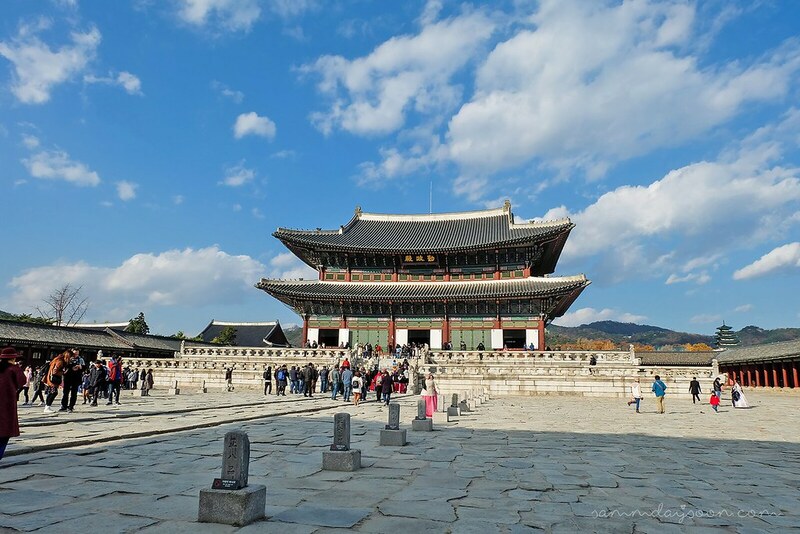 They say that Gyeongbokgung Palace is arguably the most beautiful and largest of all five palaces. It was once destroyed by fire but were later restored in 1919. Impressive details. 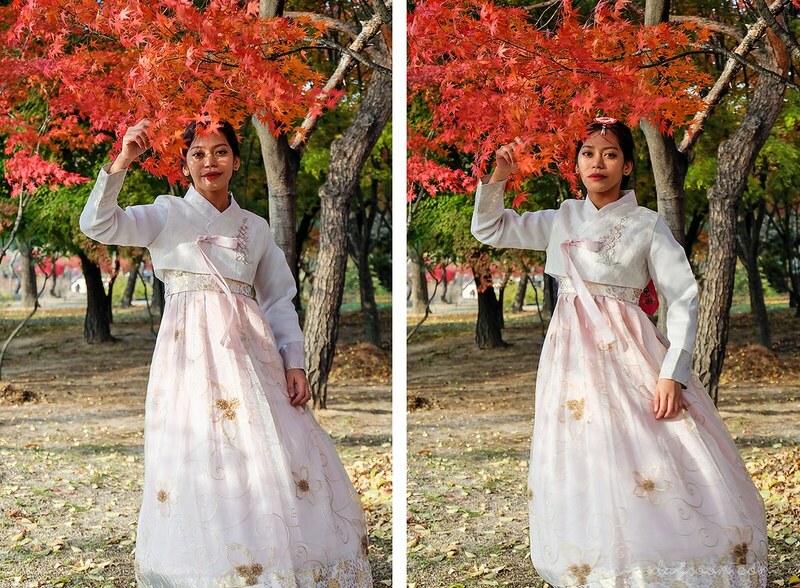 This gorgeous golden yellow shade of century-old Ginkgo Trees added a mellow dramatic vibe to the already romantic atmosphere of the palace grounds that it's impossible to ignore and not take photos. 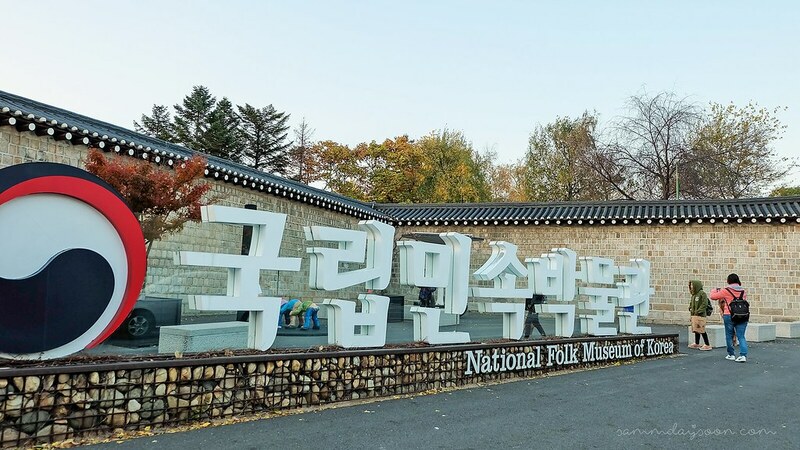 After wandering for hours, we found ourselves near the National Folk Museum which was located at the eastern grounds of the Gyeongbokgung Palace. We were bitterly cold and looking for a place to rest but the guard signaled us that the museum is already closed. 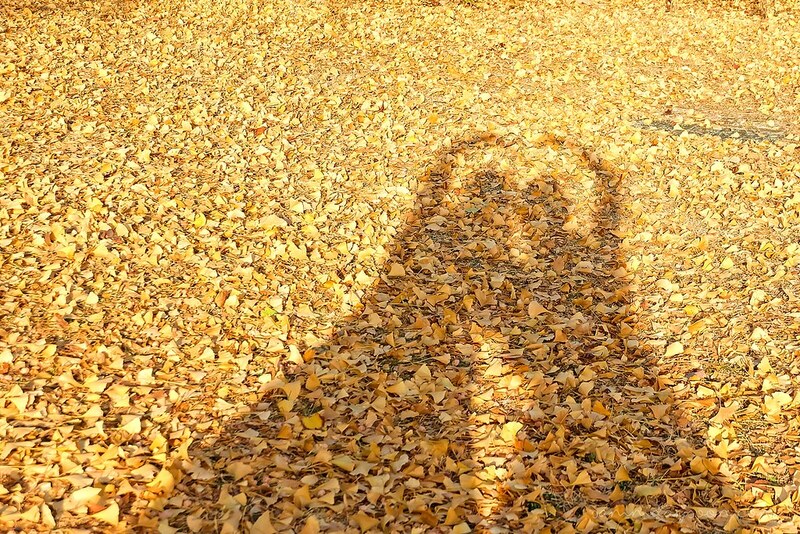 Aigoo~ Until we found this. 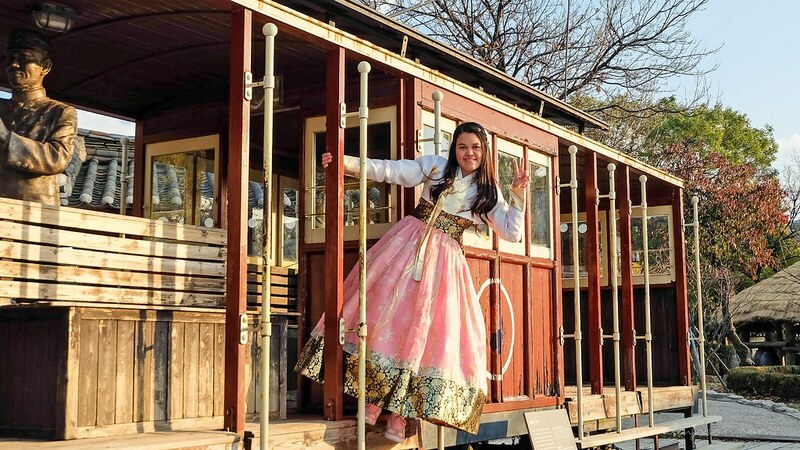 How come I'm always associated with trains when it comes to warmth and comfort. 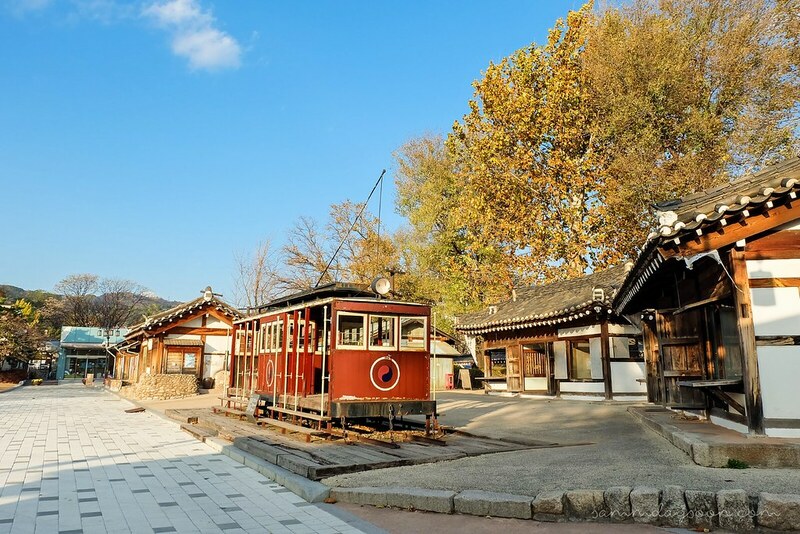 😄 For reference: Read my Seoul Travel Guide: Weather in Seoul. 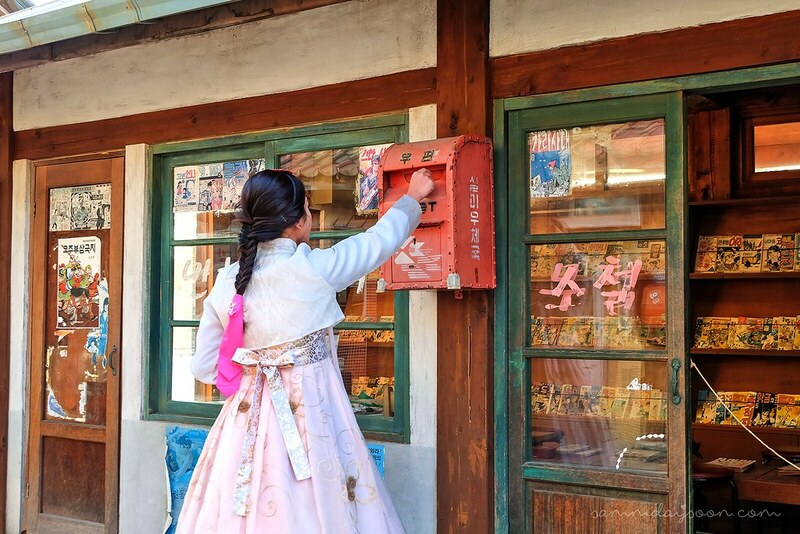 We stayed inside the train for around 30 minutes and step out to an amazing structure of old buildings and displays that depicts the life of Koreans in the past. Almost felt like entering a portal (train) and travel back in time. 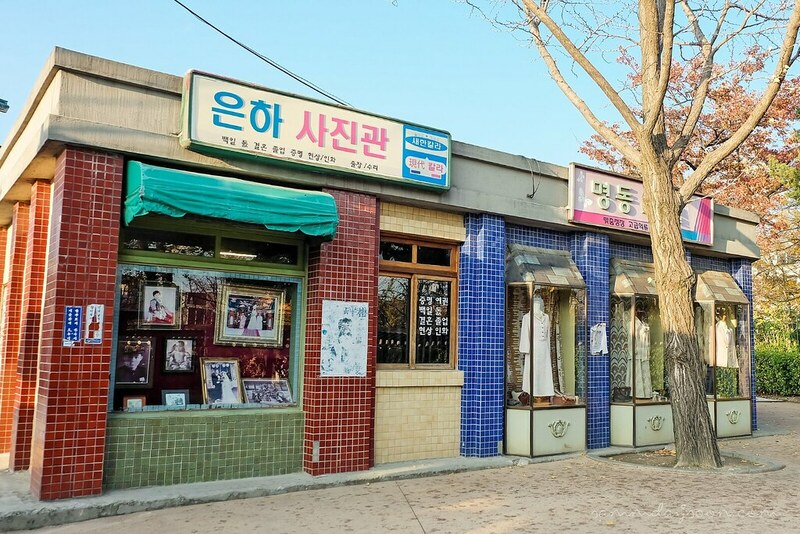 A photo studio and a boutique. A comic, post card store? 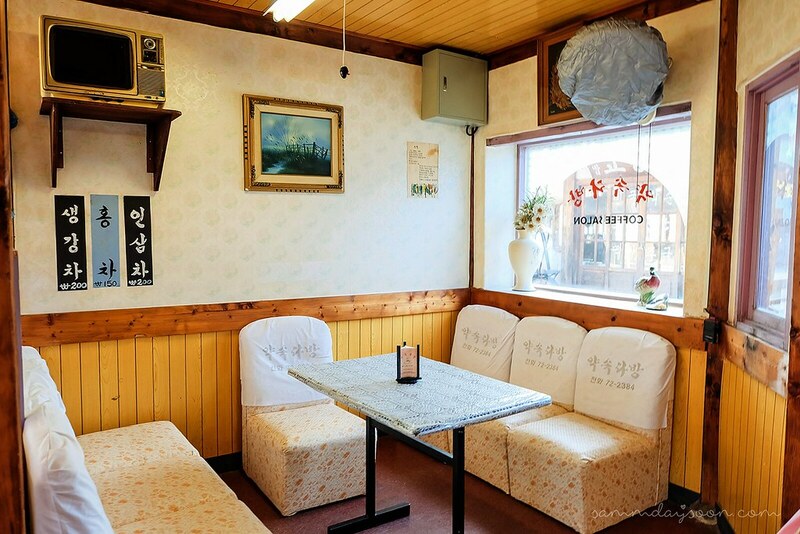 A Coffee Salon. 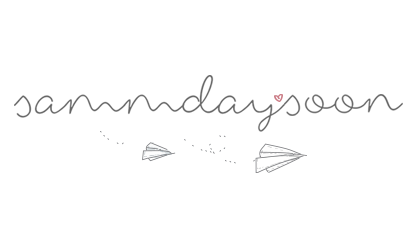 Get your hair done and take a sip of coffee afterwards. It's getting dark and we finally call it a day. We looked for the nearest exit and walk around the pillars of the palace back to the rental shop. 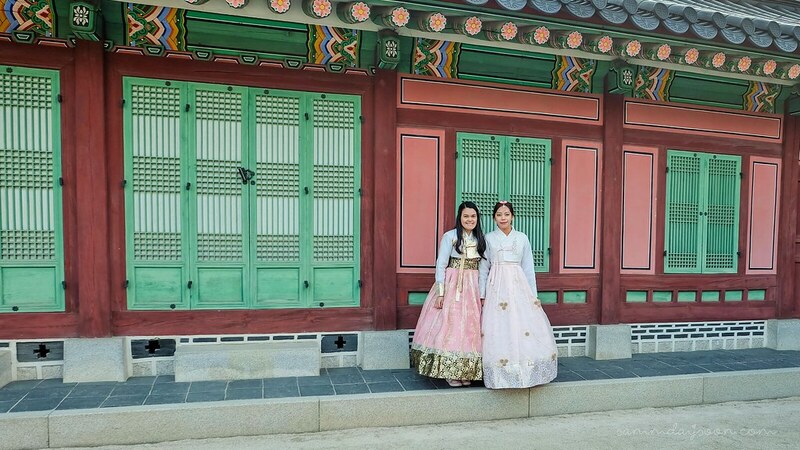 Wearing Hanbok and experiencing an authentic Korean culture was undoubtedly one of the most remarkable and happiest memory we had in Seoul. It was the perfect ending for the trip. 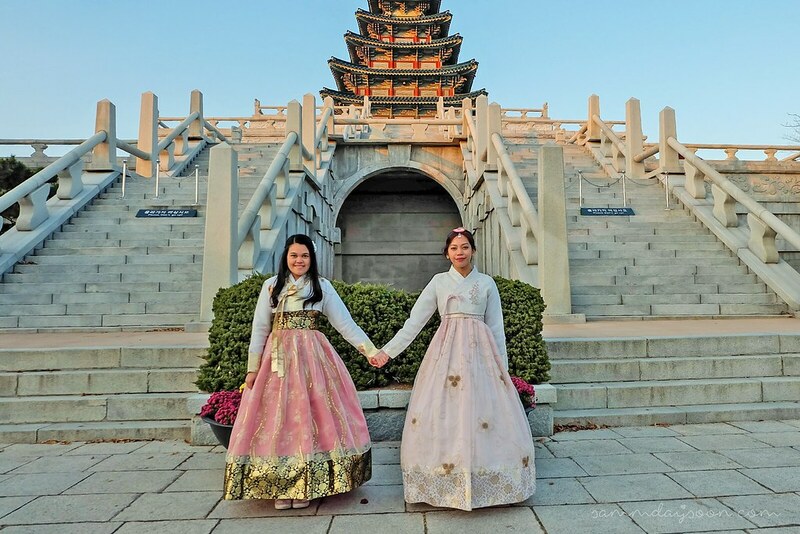 How I wish we had these same cultural activities in the Philippines of wearing traditional attires in popular attractions like Vigan, Intramuros and Las Casas Filipinas de Acuzar. 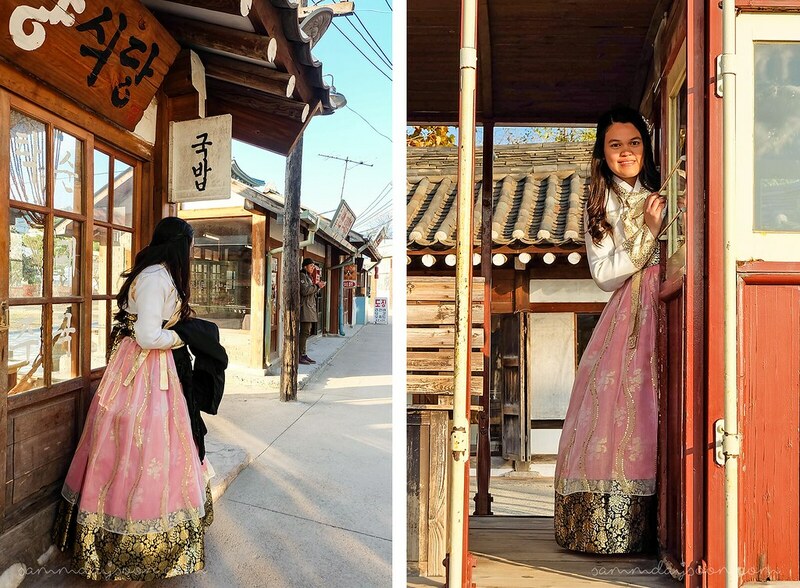 I bet many tourists would love to try it too as Filipinianas are equally beautiful as hanbok. Yes, please? 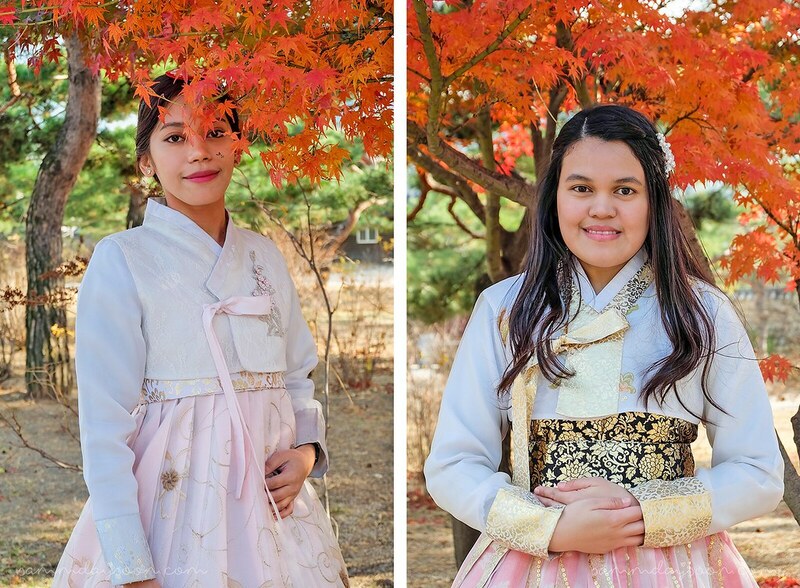 Price: Adults 3000 KRW – Children 1500 KRW – FREE if wearing Hanbok. 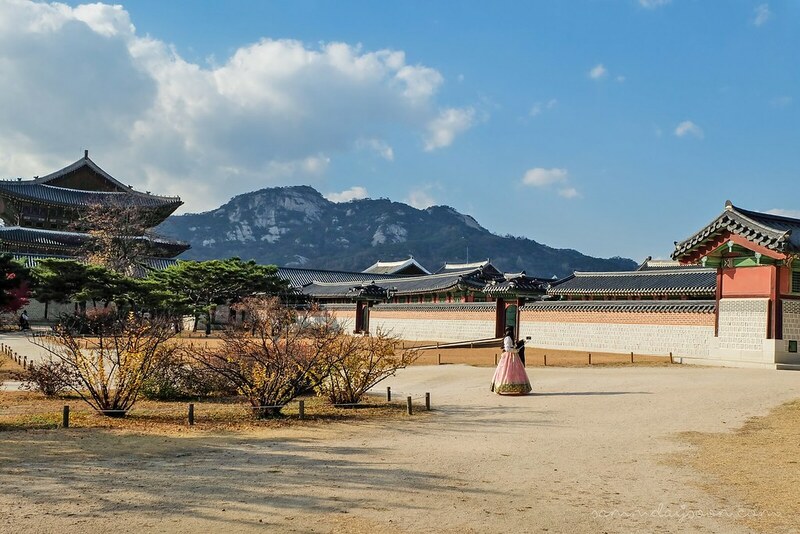 Integrated Palace Ticket: Four Palaces (Changdeokgung Palace (including Huwon, Secret Garden), Changgyeonggung Palace, Deoksugung Palace, Gyeongbokgung Palace) and Jongmyo Shrine. The ticket is 10,000 KRW and is valid for use for three months after purchase.